There are many ways you can improve the look of your outside landscaping. You can even have an element of privacy while doing it. Building a stone wall can give your yard the look you desire. A stone wall can be anywhere on the yard. The one we are building is a stone plant wall. It can be positioned around the yard for privacy, or it can be built in the yard as a matter of separation or decoration or many other things. Out stone plant wall will feature plants, herbs and flowers. You can choose which of these fit your climate and personal landscape the best. The flowers against the stone walls give an interesting contrast and decorative flare. Here is how you can construct a stone wall and help improve the look of your surroundings. It’s an easy project to do. Continue reading below to find out how. Select your materials. Pick out some rocks and stone that are flat and that compliment your current landscape. You can also choose to use bricks for this project. Stone quarries are great locations to scout for and find flat rocks and interesting variations. Mix the soil you will use in the stone wall. To do this you will need to mix compost with quality planting soil. Add some gravel as well. This will help to make sure things drain properly. Place stakes where your new stall wall to start. 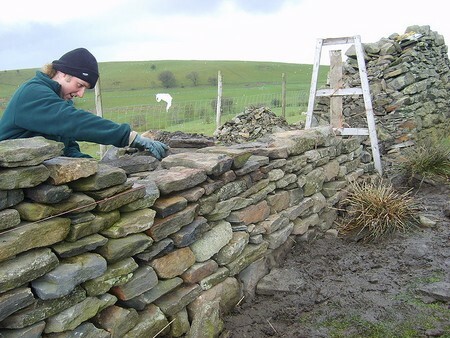 Then place a stake where you want the stone wall to end. Tie a string to the end of one stake and connect the string to the opposite stake. This will mark out the length of your stone wall. Dig a 4 inch deep trench along the path of the string. Fill the trench with sand or gravel. Tamp the base to make sure it is stable and firm. Place the rocks together over the base. Make sure to leave an inch or more between the rocks. Cover the layers of rocks with an inch of the soil mixture you created. Stagger the rocks in a design as you lay them out. Leave the larger places for plants. Finish the top with the remaining soil. Place plants, herbs and flowers into the spaces. Fill the other spaces with more soil and tamp it firm. You can even use your hands to pack the soil or use a trowel if you need. When you water, water the upper part then down allowing the water to seep down slowly.